Powerful ingredients combine to invigorate and detoxify your dog. Longevity helps to maintain healthy joints, luxurious coat, good digestion and a powerful immune system. This is our strongest rejuvenating supplement for dogs. Can "turn back the clock" for older dogs with rapid visible results. Also the choice of "natural" breeders. A blend of 14 natural ingredients, including bee pollen, spirulina, glucosamine, chondroitin, MSM, vitamin C, etc. "…within two weeks, he was back to his normal energy and movement!" • Check out the Combo for a comparable option, in chewable tablet form. Longevity is the most comprehensive health supplement we have for dogs at all life stages. A powdered formula that is easily mixed into something wet, Longevity helps to nutritionally support growing puppies as well as aging seniors. The live enzymes, vitamins, and minerals in Longevity contribute to digestive, immune, and joint health, and also maintain healthy energy levels. Longevity is especially useful in supporting the body's daily detoxification process, which helps dogs stave off common environmental toxins. Some customers may prefer using chewable supplements over a powder. The Combo (Fresh Factors and Joint Health Chewables sold together) contain most of Longevity's ingredients in a chewable form. Longevity Longevity is a powdered supplement that supports skin & coat, digestion, joint, and overall health in dogs. Directions for use: Add to dog's regular feed ration daily. Recommended: For best results, start out with just a sprinkle for the first few days and gradually increase to desired amount. Amount may be doubled or tripled for older dogs or as desired. *Not recognized as an essential nutrient by the AAFFCO Dog Food Nutrient Profiles. Calorie Content (fed): 3,366 kcal ME/kg or 27 kcal ME/2 teaspoons. Ingredients: Bee Pollen, Spirulina, Desiccated Beef Liver, Active Dry Yeast (Saccharomyces Cerevisae), Glucosamine HCl, Methylsulfonylmethane, Chondroitin Sulfate, Ascorbic Acid, Carrot Powder, Citrus Bioflavonoids, Hesperidin, Dried Kelp, Salt, and Biotin. Mathew B et al. Evaluation of chemoprovention of oral cancer with Spirulina fusiformis. Nutr Cancer.1995;24:197-202. Hernandez-Corona A, Nieves I, Meckes M, Chamorro G, Barron BL. Antiviral activity of Spirulina maxima against herpes simplex virus type 2. Antiviral Res. 2002 Dec;56(3):279-85. Hayashi T, et al. Calcium spirulan, an inhibibitor of enveloped virus replication, from a blue-green algae Spirulina platensis. J Nat Prod 1996;59:83-7. Babu, M et al. Evaluation of chemoprevention of oral cancer with spirulina. 1995. Nutrition and Cancer, Vol. 24, No. 2, 197-202. Lisheng, et al. Inhibitive effect and mechanism of polysaccharide of spirulina on transplanted tumor cells in mice. 1991. Marine Sciences, Qingdao, N.5. 33-38. Schwartz, et al. Inhibition of experimental oral carcinogenesis by topical beta carotene. 1986. Harvard School of Dental Medicine. Carcinogenesis, May 1986 7(5) 711-715. Schwartz, J. G. Shklar, et al. Prevention of experimental oral cancer by extracts of spirulina-dunaliella algae. 1988. Harvard School of Dental Medicine. Nutrition and Cancer 11, 127-134. Becker, E. W., et al. Clinical and biochemical evaluations of spirulina with regard to its application in the treatment of obesity. Inst. Chem. Pfanz. Nutrition Reports Int'l, vol. 33, No. 4, 565. Nayaka, N et al. Cholesterol lowering effect of spirulina. 1988. Tokai univ. Pub. in Nutrition Reports Int'l, vol. 37, No. 6, 1329-1337. Gonzalez R, Rodriguez S, Romay c. et al. Anti-inflammatory activity of phycocyanin extract in acetic acid-induced colitis in rats. Pharmacol Res. 1999;39:1055-1059. Mathew B, Sankaranarayanan R, Nair PP, et al. Evaluation of chemoprevention of oral cancer with Spirulina fusiformis. Nutr Cancer. 1995;24:197-202. Romay C, Armesto J Remirez D, Gonzalez R, Ledon N, Garcia I. Antioxidant and anti-inflammatory properties of C-phycocyanin from blue-green algae. Inflamm Res. 1998;47:36-41. 13 year Old Still Surfs! My dogster, Sooz, is a former laboratory Beagle who retired at age five and came into my life. She used to have back and/or neck problems. Sooz would tweak something every few months by either jumping off the couch or stepping wrong down the stairs, and would have to be on meds to get through it. But, since I discovered Springtime's Longevity in 2010, she has maintained her mobility and is as healthy and happy as can be! I can't thank you enough for an amazing product! This is Sooz surfing this past summer at age 13! Look at her GO!!! THANK YOU, SPRINGTIME!!! So many things to sniff, so little time! Toffee is a Longevity Puppy! 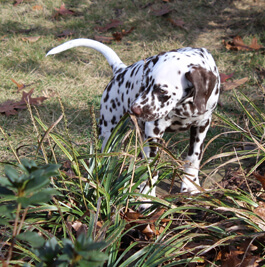 I just wanted to let you know that this very special spotted baby has been on Longevity since she started eating dry. 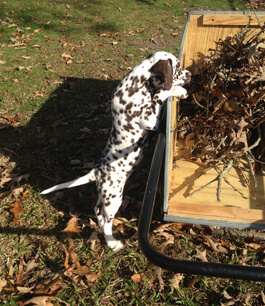 If you ever need a Dalmatian spokes-puppy, Toffee is a ham! She just turned 6 months. The Great German Shepherd, Vaughn. "He began playing ball again…"
I've purchased several supplements for my dogs before but nothing as effective as Springtime. I've used Springtime for about three years now. I now even have my family buying Springtime products. It doesn't matter what you buy, it's top quality and you won't be disappointed. I had a 10-year-old German Shepherd named Vaughn, who began having some issues in January of 2016. I was devastated. I went to a couple of vets who all told me the same thing, which was that my best friend was most likely going to leave us soon. I wondered if there was anything I could do to help Vaughn be comfortable, besides what the vets were giving. Vaughn was beginning to just lay around, not wanting to get up to greet us at the door as he always did. I stumbled across a breeder's website that uses your supplements and swears by them. As I had emailed a couple of other companies who never responded, I was surprised when I got a response! Someone actually willing to listen. I was so grateful. Springtime recommended me Longevity and Advanced Hip & Joint Chewables and I started Vaughn on them immediately. I could not believe my eyes. He literally turned into a different dog. He began playing ball again, something he had not done in months. He would greet us at the door when coming home. I could notice a huge difference in his overall health. It was such a pleasant sight to see. Unfortunately, the inevitable happened. We lost my baby a few months later. It was one of the most difficult times in my life, to lose Vaughn. He grew up with our children and was a protector for all he loved. I cannot thank your company enough for giving me the best, last months with our baby. Vaughn felt the best he could, using Longevity and Advanced Hip & Joint Chewables and benefitted from your products. I am forever grateful. "So many people ask me how I get her coat to be so shiny!" I have been using Springtime Longevity for over 10 years. My dogs have thrived. My 16-and-a-half-year-old girl just passed away last year, and her litter mate lived to 14 and a half (with severe epilepsy...no small feat). I really do, in part, attribute their healthy lives to Longevity. Ginger, my 1-year-and-9-months-old Staffordshire Bull Terrier, is on a raw diet. 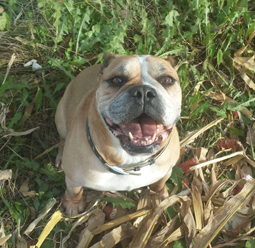 She is a happy and healthy pup, thanks to Longevity and Skin & Coat Oil! So many people ask me how I get her coat to be so shiny! She also is most impressed with your Choice Bully Sticks and reports that they are the best in town. Thank you, Springtime. You have a customer for life! Annabelle, held by Heidi's 13 year old daughter, Helena, feels younger than ever! "...I have weaned her off of ALL of her medications..."
I just want to say Thanks! My 11-year-old, 8-lb. 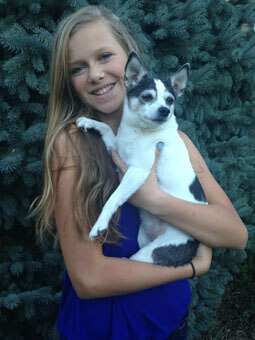 Toy Rat Terrier, Annabelle, was on suffering from back problems. She would barely walk, even in the house. I found out about Longevity when searching for alternative methods for maintaining her inflammation. Now, 2 months later, she is back to her normal self and back to her long walks around the neighborhood. She is running around, playing fetch, and acts younger than ever. Her coat looks beautiful, and her grass allergies are not as severe this year either. I swear your product is a helps support her natural healing process. I can't thank you enough for giving our Annabelle her life back. Booker, the Bulldog mix, is 13 years young!